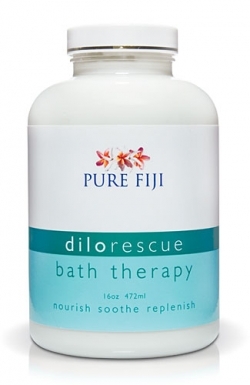 The Dilo Rescue Bath Therapy is a traditional blend of fresh coconut milk with dilo nut extract and aromatic herbs to help rejuvenate your skin, release tension in muscles and joints while restoring balance and calm. Rescue, Rehydrate and Rejuvenate body and soul with this soothing bath therapy. A traditional blend of fresh coconut milk with dilo nut extract and aromatic herbs to help rejuvenate your skin, release tension in muscles and joints while restoring balance and calm.